Dwain Wall added Oklahoma State University to their education. Dwain Wall updated their location to Fort Lauderdale, FL, USA. Dwain Wall added CHINA EVENTS, SOUTH AMERICA EVENTS, SOUTH AFRICA EVENTS, MED EVENTS, CARIBBEAN EVENTS, ISLAND EVENTS, RESORT TAKE OVERS, CRUISE CHARTERS, CRUISE VACATIONS to their skills. Dwain Wall added EXPLORATION TRAVEL, LUXURY CRUISES, EXPEDITION CRUISES, ADVENTURE TRAVEL, TOURISM to their interests. Dwain Wall added English to their spoken languages. Dwain Wall added CIC - Convention Industry Council to their associations. Dwain Wall added ASTA - American Society of Travel Agents to their associations. 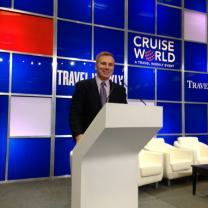 Dwain Wall added CLIA - Cruise Lines International Association to their associations. Dwain Wall added Whet Travel to their work history. Dwain Wall updated their profile image.